This post is just a footnote to Marcus Nunes’s demolition of Glenn Hubbard’s recent comments on Fed policy, pointing out that Hubbard, as late as July 2008 when the US economy was rapidly contracting in the run-up to the impending financial crisis, was warning that monetary policy was too easy. OMG he though monetary policy was too easy in 2008! Just to put things into a little clearer perspective, here is a comparison of the monthly year on year change in the CPI in 2008 and 2011. 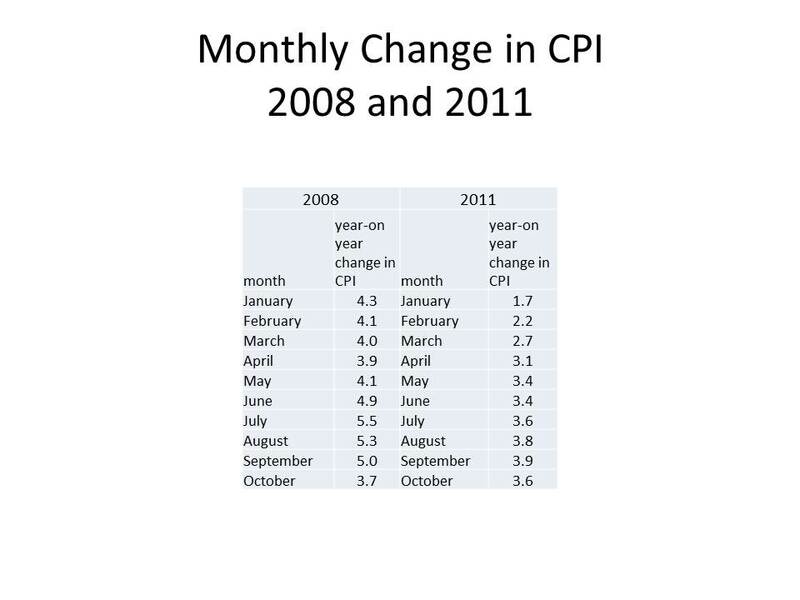 As you can see, the monthly year-on-year change in the CPI, driven by rising oil and food prices, was running at over 5% in the summer of 2008, providing the inflation hawks on the FOMC with the ammunition they needed to keep the Fed from easing money in time to avert the financial catastrophe down the road. And now with inflation running 2 percentage points lower than it was in 2008 before the crash, we are again being warned that inflation is the problem. Plus ca change. Hawks indeed. With nervous eyes looking up at the high inflation, they failed to see the approaching cliff’s edge. Heck of a great job, FOMC, you drove us all right over the cliff. I’m no fan of Hubbard, but what about the counterfactual? Inflation was accelerating across a broad ranges of prices in 2q08, and especially in China import inflation (a proxy for tredeables prices). So if the Fed had avoided the 2008 crisis by guaranteeing the debt of the GSE’s and the banking system in August, what would the inflation rate have been by December? Dustin, You summed it up really well. David, That’s why I don’t think that we should be targeting inflation. It gives you too many false positives. The CPI seems of little value. I guess that is why you and Scott Sumner are gaining converts to NGDP targeting. NGDP seems like it would be easiery to calculate and would work much better. And the Fed´s attention was historically the Core COI (or PCE) and Bernanke suddenly started “worrying” about the headline number! Hubbard’s comments are infuriating, and Marcus’s savaging of them well deserved. You can say that NGDP targeting is a bad idea because nobody believes the central bank, so it won’t work. That’s a coherent argument. You can say that NGDP targeting is a bad idea because it will cause catastrophic inflation. That’s a coherent argument. But you *cannot* say both at once! Meanwhile, the last readings for CPI, PPI and unit labor costs are all down. Inflation caused by global commodities bubbles or rises may have to be tolerated–if the fed tightens just as consumers are getting whacked with higher gasoline prices—that is a toxic combination. Again, again, again: A peevish fixation on zero inflation is not a monetary policy, it is only the facade of a monetary policy. Zero inflation by itself is not a good. A more difficult, but responsible monetary policy is to try to create real growth. Real output and employment are goods. Stable prices are just indexes, numbers. In fact, I am beginning to wonder if even a 2 percent inflation target is too low, as it is too close to zero, and the problem you get when the economy is feeble but interest rates are already bounded. Investors need optimism and boom times. Who will buy real estate in a deflationary environment? Making for a sustained deflation. Think Japan. There are far greater dangers in deflation than inflation. Mild, varying inflation and robust real growth are companions; see the USA from 1982 to 2008. Show me a nation in sustained deflation doing anything, anywhere. Floccina, There are two issues. First, is the CPI a meaningful reflection of the general level of prices? Second, is the general level of prices the relevant variable that we want to stabilize? I think that the answer to both is no. In principle, we should try to stabilize the wage level, but NGDP is probably more practical. Marcus, What were they thinking? Will, You are obviously a pedant. Benjamin, You are right on the big picture. However, I still believe that we should let positive supply shocks reduce inflation or cause deflation, while letting negative supply shock increase inflation. as far as I know the Fed is targeting not CPI, but PCE ex food and energy, and the Fed did cut rates to well below inflation in 1q2008. This is the right thing to target for the US with ultracheap gasoline and without a federal VAT. It’s amazing how these guys can be so wrong, again and again, with no learning or shame. genauer, You are right that the Fed did cut rates to 2% in March 2008, but for the next 7 months till mid-October, the Fed left rates at 2% even though unemployment was rising rapidly, and the economy contracting, and contracting rapidly in the 3rd quarter even before the Lehman debacle. And if you read the FOMC minutes you will see that the justification for not easing policy, despite a badly deteriorating economy, was concern about “headline” inflation (i.e., the CPI) not core inflation. Barry, Well, I am certainly amazed.